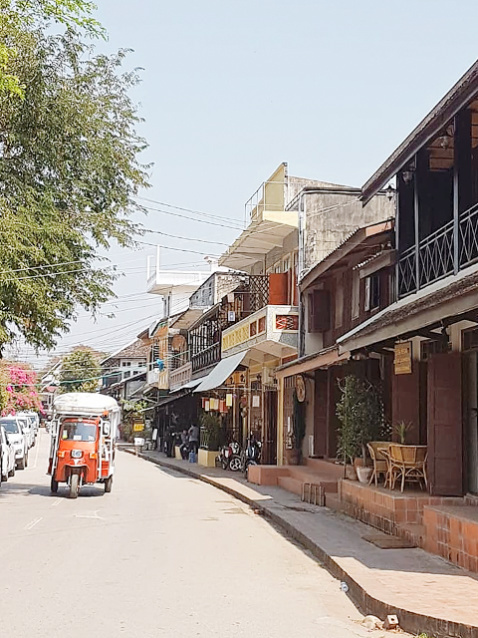 A rest day is a blessing wherever we have it but to have one in Luang Prabang is a real privilege. The hotel was a delight and it would have been tempting to spend the day lazing here but we wanted to make the most of our day. 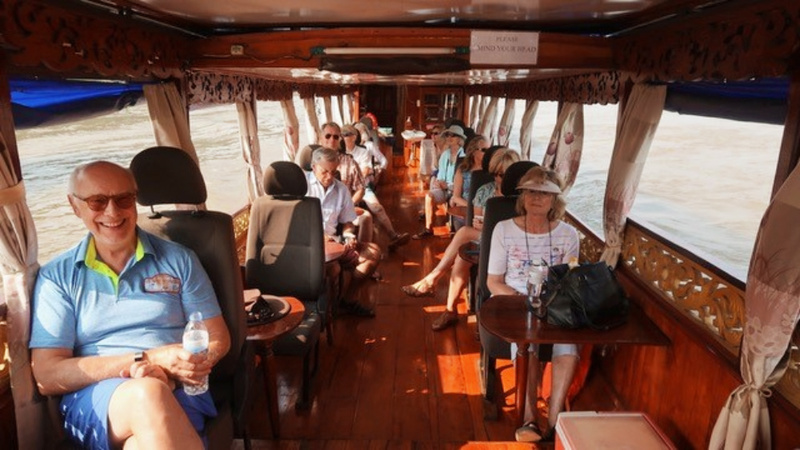 Two tours were on offer, a river cruise to a cave up the Mekong and a town tour of Luang Prabang. 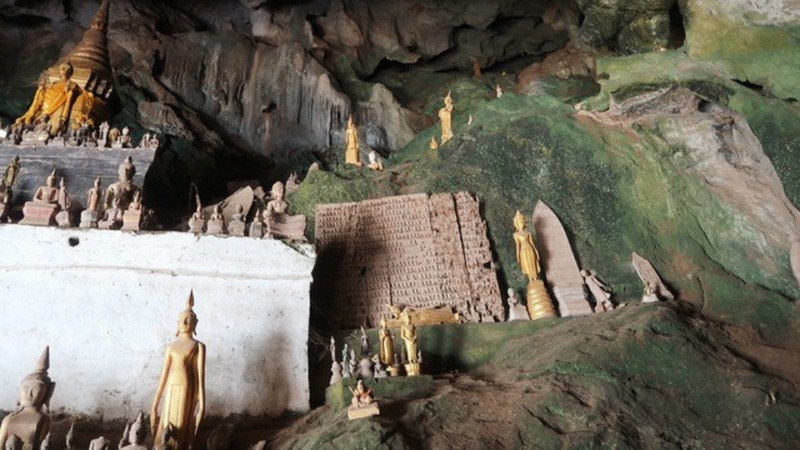 The Mekong river is quite low in the dry season but full enough for us to travel upstream to a cave on the bank in which 4,000 Buddha tributes were located. 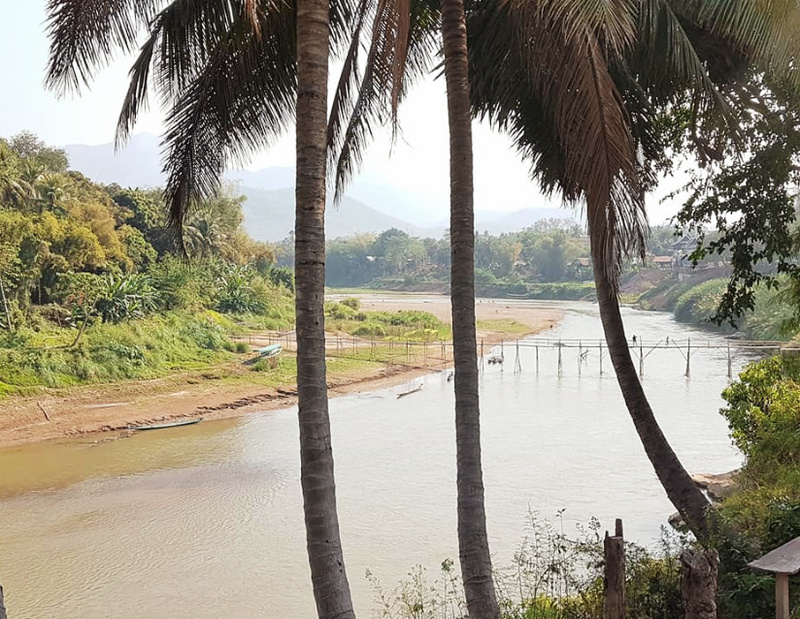 It was a peaceful trip and we learned that the Chinese are building a high speed railway from China to Bangkok right through Laos. 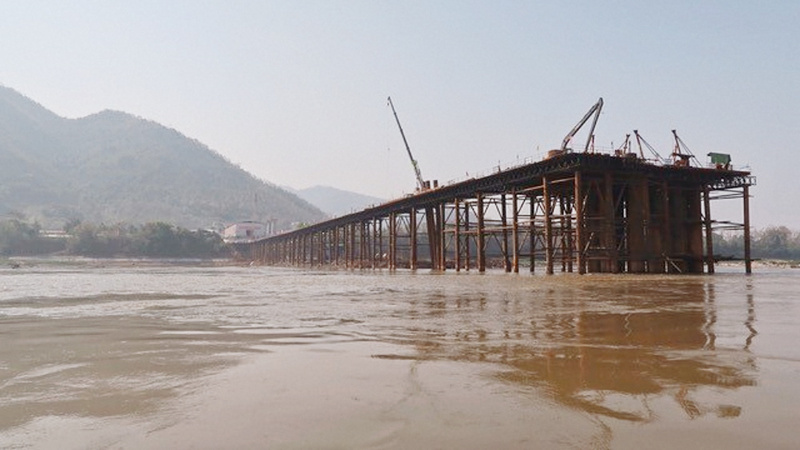 The bridge across the Mekong is only half built but the line is due for commissioning in 2019. 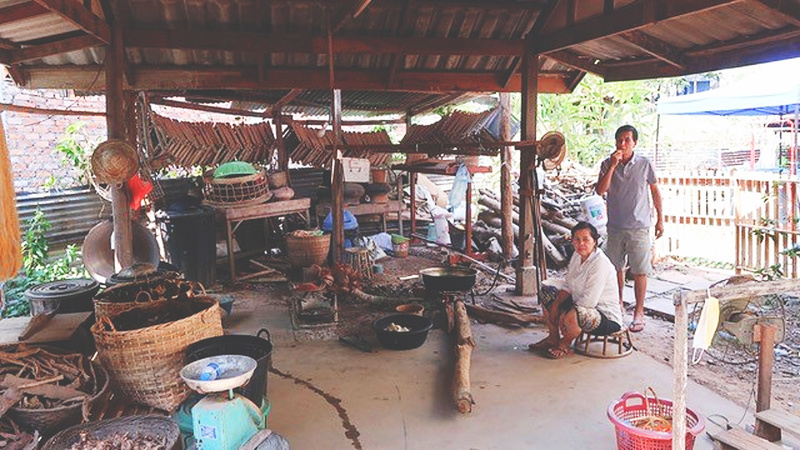 What this does to the Laos economy goodness only knows. 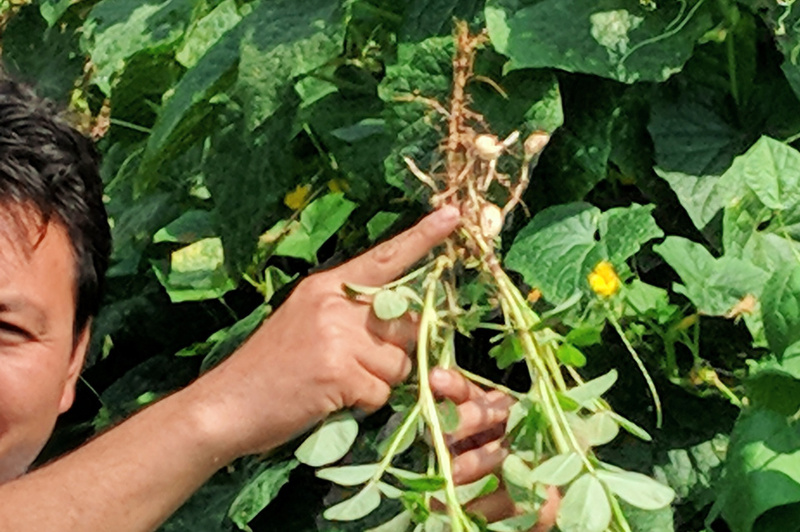 We stopped off at a peanut farm and learned that peanuts grow underground. Who knew that? 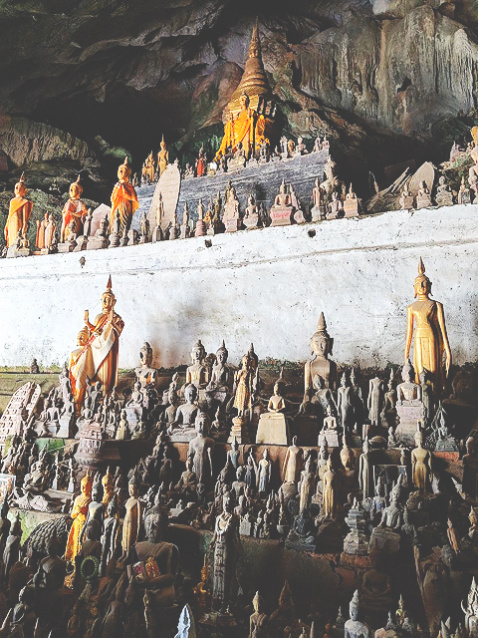 The cave itself was not much more than a niche in the rock and crowded with Chinese tourists with little sympathy for the sacredness of the place. 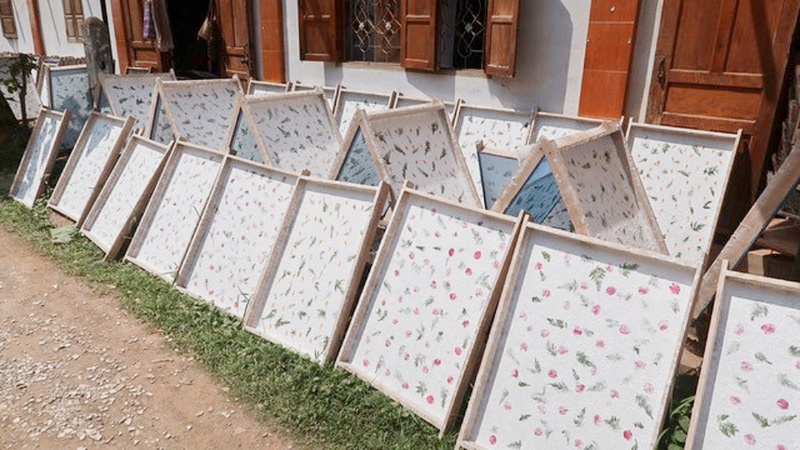 On the trip back we stopped to see how fancy paper is made and how the silk weaving process operates in Laos, including how the silk is dyed. Some retail therapy was achieved! Sheila and Andy took advantage of late afternoon temperatures to ride by bike from our hotel to the river. 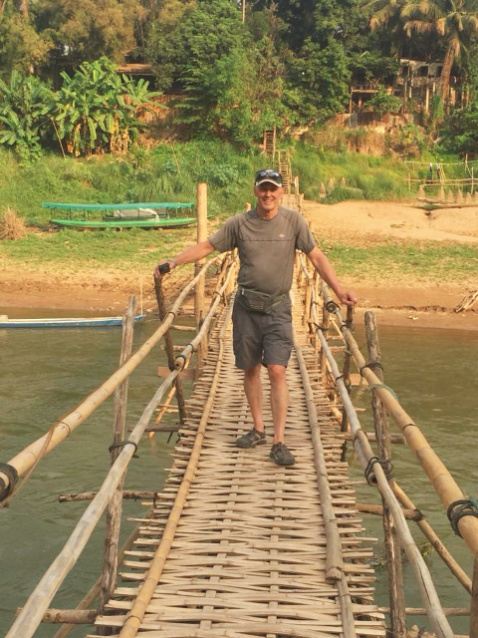 They have wanted to walk across the bamboo bridge which is a short cut from one part of town to another for awhile, having been here before. 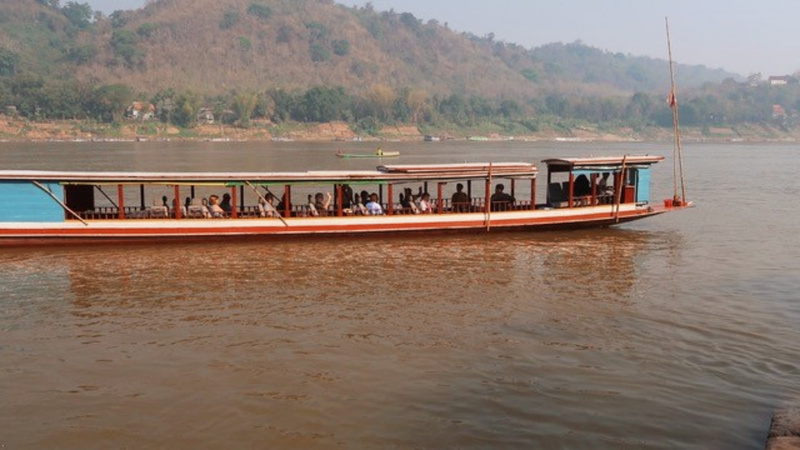 During the rainy season and whilst river levels are high, it is dismantled because the current is too strong for even bamboo. 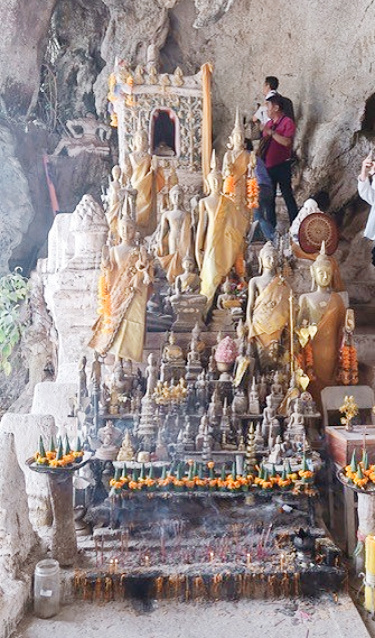 It is rebuilt every year. Their previous two visits have been made during and just after the rains. So this is their moment to finally walk across. 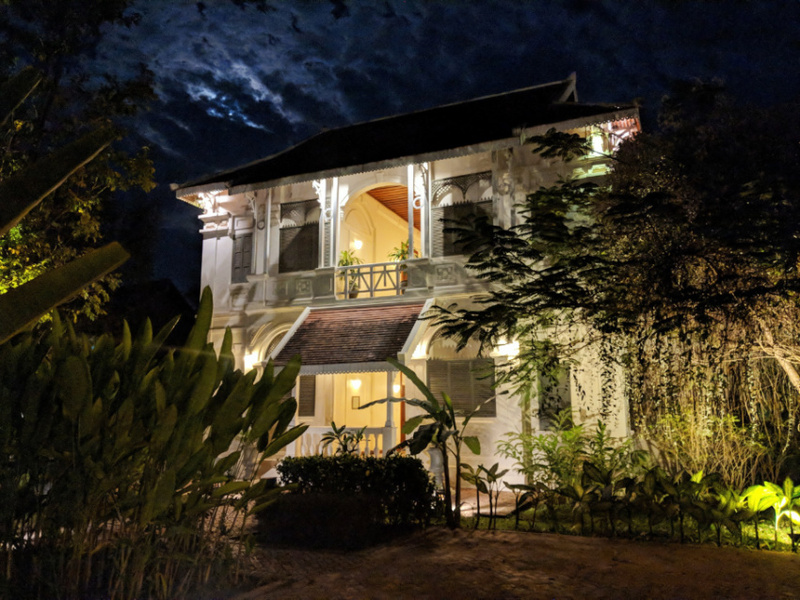 The town of Luang Prabang has a real French Colonial feel to it and you have to remind yourself that you are in fact still in South East Asia and not in provincial France. The carpark was full of activity in the afternoon, with wheel bearings to be replaced, split radiators to be welded, brakes to be fixed, power steering to be investigated and fuel pumps to be replaced. Paul has worked his socks off today and deserves a beer from us all. 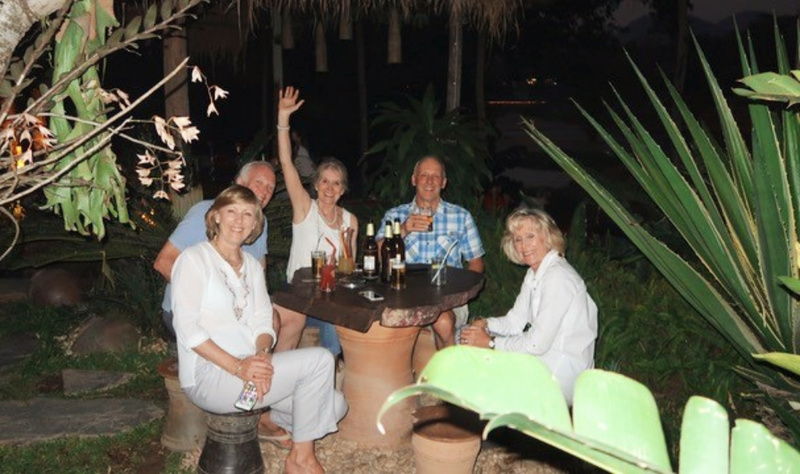 Today was also Adele’s birthday but there wasn’t an opportunity for us all to come together to celebrate as we had all headed off to different restaurants for dinner. 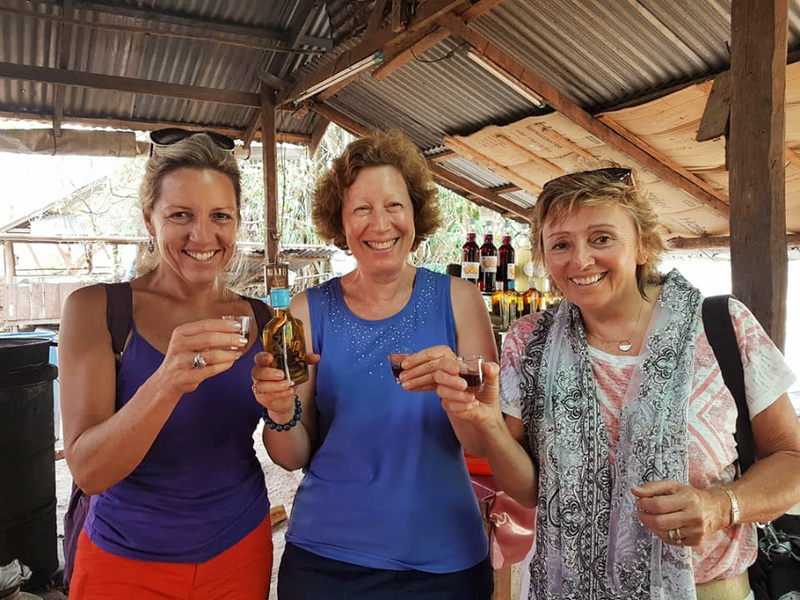 There was a chance for Adele, Karen and Jo to have a “pre-celebration” tasting of the locally made rice whiskey. And we shall celebrate in true rally style tomorrow. Most enjoyed eating out in town in the evening; a memorable experience. Well done Paul and all participants in keeping the cars going on such a gruelling rally.